Note: the release is coming out on the 28th instead due to an unforeseen issue. Our goal with the layout is to help folks, both new and existing, navigate the packages to find the one that is right for your playstyle, access-level, and pocketbook. It is also exceedingly attractive now that we have a talented, full-time, 2D artist in Scarlet! Let's go over the changes to the packages that you can expect next week. If you were on the fence about upgrading or laying something away, consider this your final warning! Please note, the items listed below are just the top highlights, not the full package listing. You will be able to see the full details of the new packages when they drop on December 27th. Overall, it is a better deal to get the original packages. If you have an existing package and are looking to upgrade, doing so after December 27th will mean you will be upgrading to the new packages. The exception to this is Layaway. If you put one of these original packages on Layaway, you will reserve the original rewards. It comes at the cost of not owning the tiers in-between. For example, if you are currently pledged at Founder (now $100) and you have aspirations to be a Baroness (now $250), you may put the Baron/Baroness package on Layaway before December 27th to get the full, original package. However, once you've paid $150 total, you will not have unlocked the Exposition Access from the old Bloodline package, nor the 225 total EP. You would not receive those rewards until the entire $250 is paid off. Please note that if you are laying away a package that includes selection of a settlement, there will be a cap on number of settlements on a server. It is first-come, first-served on locking in those slots. You lock in your slot by paying off the package entirely, not by laying it away. Also, if you cancel your Layaway after December 27th, you will only be able to apply your Store Credit to the new packages. If you put King/Queen on Layaway to 'lock in' the original packages, but only ever intend to pay $2000 hoping to score the Celebrity package, you are in for a bad time. You'd have to cancel your layaway at some point and reapply it to a new package that won't be as good as Celebrity. In short, only lay away a package you are sure you will pay off before you want the rewards. I don't say these things to frighten or coerce you, but to give you full disclosure on your options so there is no confusion. If you find these options to be acceptable, grab those gift cards and head to the store to snag an existing package before the new ones roll out on December 27th! @Thrud I think in the one of the November Dev Journals they said they would not be posting the EP store with individual items such as houses etc. until they are further down the road in development. They want to avoid users getting upset as they will be adding much more content to the EP store in the coming months and didn't want community members to regret purchases now that they might like something else better down the road. I am sorry if that is answered elsewhere, but 3 questions are bothering me: 1. When EP store shall open? 2. I miss add-ons somewhere... 3. is there possibility for "layway-like" purchasing for new tiers? In case i can't pull $1k at once? And judging by current spark price there will be another update before official release. HI, Happy New Year to all Elyrians ;) I am sorry if that is answered elsewhere, but 3 questions are bothering me: 1. When EP store shall open? 2. I miss add-ons somewhere... 3. is there possibility for "layway-like" purchasing for new tiers? In case i can't pull $1k at once? And judging by current spark price there will be another update before official release. I clear the cache and clicked on stretch goals but did not get the page, is that being worked on? Nice set up. If you bought the Count tier for $500 during the Kickstarter or before the change yesterday you still have the Count tier and everything that comes with it. Currently, not all rewards are accurately reflective of those older tiers but they are fully aware of what everyone is supposed to get. They just had to make the current listings initially centered around the new changed tiers. Posted By **Wienerschnitzel** at 2:25 PM - Thu Dec 29 2016 > > I bought count for 500 so do I still have that tier or do I have the lower tier If you bought the Count tier for $500 during the Kickstarter or before the change yesterday you still have the Count tier and everything that comes with it. Currently, not all rewards are accurately reflective of those older tiers but they are fully aware of what everyone is supposed to get. They just had to make the current listings initially centered around the new changed tiers. Very pretty, love the new theme. I can't wait to see the rest of the website on it. Just a note - on mobile (iPad Air 2 using Chrome) I can't click the "Stretch Goal" button in the store to look at the goals. Very pretty, love the new theme. I can't wait to see the rest of the website on it. Just a note - on mobile (iPad Air 2 using Chrome) I can't click the "Stretch Goal" button in the store to look at the goals. Got a question. Sorry if it was already asked and answred but didn't see it at a galnce. I am Astronomer now. If i upgrade to, lets say, Magistrate..... I actually get nothing but the EP? Or did i miss something here? Got a question. Sorry if it was already asked and answred but didn't see it at a galnce. I am Astronomer now. If i upgrade to, lets say, Magistrate..... I actually get nothing but the EP? Or did i miss something here? Magistrate is pretty much the new Astronomer tier, but more expensive, so you'd be better off spending your $ on pure EP under Store > Merchandise in my opinion. All-in-all, you are now at the Magistrate tier, but you got it cheaper for backing early. Posted By **Atogrim** at 11:26 AM - Thu Dec 29 2016 > > Got a question. > Sorry if it was already asked and answred but didn't see it at a galnce. > > I am Astronomer now. > If i upgrade to, lets say, Magistrate..... > I actually get nothing but the EP? > Or did i miss something here? Magistrate is pretty much the new Astronomer tier, but more expensive, so you'd be better off spending your $ on pure EP under Store > Merchandise in my opinion. All-in-all, you are now at the Magistrate tier, but you got it cheaper for backing early. Thanks. So the only upgrade that would be worth it would be the new Count Level at 1000 USD. Mhhhmmmm......way to go from Astronomer. Posted By **Barghest** at 12:29 PM - Thu Dec 29 2016 > > Posted By **Atogrim** at 11:26 AM - Thu Dec 29 2016 > > > > > Got a question. > > Sorry if it was already asked and answred but didn't see it at a galnce. > > > > I am Astronomer now. > > If i upgrade to, lets say, Magistrate..... > > I actually get nothing but the EP? > > Or did i miss something here? > > Magistrate is pretty much the new Astronomer tier, but more expensive, so you'd be better off spending your $ on pure EP under Store > Merchandise in my opinion. All-in-all, you are now at the Magistrate tier, but you got it cheaper for backing early. Thanks. So the only upgrade that would be worth it would be the new Count Level at 1000 USD. Mhhhmmmm......way to go from Astronomer. Any information on all the EP Add-ons? i noticed that part of the shop is just completely gone. Thanks for the update. The result is that the team has decided, and I support them, to delay the Exposition Store until we feel confident that you all would be confident in spending your EP. We don't know what we don't know, therefore we don't yet have an expected date for when it will be released. 'Forgive my inquest, Vye, but are you hazarding to elucidate that the Exposition Store is not demoted to a mere subsequent release but will, in fact, remain in such a state of limbo for some undetermined amount of time?' you ask with a faint flutter of your eyelashes. Yes, and it's not because we didn't make the Exposition Store. It's because it's not yet good enough. It's not ready and we should have realized this earlier--probably before we said we were making it but, like I said, we sometimes make mistakes. This mistake not only took up a lot of development time that could have been spent on the game, but also set expectations with the community that will undoubtedly lead to disappointment. Disappointment is not a habit we want to get into, so I hope that you will understand that we are suspending the Exposition Store release for good reasons: quality, integrity, and compassion. Chronicles of Elyria must be a game of quality. Soulbound Studios must be a studio that acts with integrity. As a community, both you and I, must demonstrate compassion toward one another. This is how we will deliver on the promises that have captured our collective imagination and drive the team every single day. Posted By **StrawHat** at 03:06 AM - Thu Dec 29 2016 > > Any information on all the EP Add-ons? i noticed that part of the shop is just completely gone. Thanks for the update. https://chroniclesofelyria.com/blog/15157/Forging-A-Legacy The result is that the team has decided, and I support them, to delay the Exposition Store until we feel confident that you all would be confident in spending your EP. We don't know what we don't know, therefore we don't yet have an expected date for when it will be released. 'Forgive my inquest, Vye, but are you hazarding to elucidate that the Exposition Store is not demoted to a mere subsequent release but will, in fact, remain in such a state of limbo for some undetermined amount of time?' you ask with a faint flutter of your eyelashes. Yes, and it's not because we didn't make the Exposition Store. It's because it's not yet good enough. It's not ready and we should have realized this earlier--probably before we said we were making it but, like I said, we sometimes make mistakes. This mistake not only took up a lot of development time that could have been spent on the game, but also set expectations with the community that will undoubtedly lead to disappointment. Disappointment is not a habit we want to get into, so I hope that you will understand that we are suspending the Exposition Store release for good reasons: quality, integrity, and compassion. Chronicles of Elyria must be a game of quality. Soulbound Studios must be a studio that acts with integrity. As a community, both you and I, must demonstrate compassion toward one another. This is how we will deliver on the promises that have captured our collective imagination and drive the team every single day. Thanks for your patience while we got the new website deployed. Hopefully you've had a chance to take a look at it. In general, the layout and feel of the store mirrors the plans for the v3 website. Of course, things could change as we iterate on the new design but I think it looks pretty nice all-in-all. As for the packages, most of them are more expensive, and all of them lost some value. We removed the custom emotes/salutes, we removed the Phoenix pet from all tiers, the EP is generally less per tier, and there's no more Merchandise Credit, which was between $25 and $100 depending on the package. Regarding any fear about "loss of stuff" because something isn't greyed out, your previous packages are all intact. If you purchased during the Kickstarter period, or during the period of Kickstarter packages, you still have all the items that you thought you did. We've got them all covered. However, when it came time to track the stuff in previous tiers, we went from 19 packages down to 12, which required some tricky mapping. For the moment, the content of the old packages are not reflected in the new packages with respect to what you've got included (i.e. what is greyed out). Don't worry. We'll get to that as soon as we can. Just know that we've still got your stuff safe and sound. Thanks for your patience while we got the new website deployed. Hopefully you've had a chance to take a look at it. In general, the layout and feel of the store mirrors the plans for the v3 website. Of course, things could change as we iterate on the new design but I think it looks pretty nice all-in-all. As for the packages, most of them are more expensive, and all of them lost some value. We removed the custom emotes/salutes, we removed the Phoenix pet from all tiers, the EP is generally less per tier, and there's no more Merchandise Credit, which was between $25 and $100 depending on the package. Regarding any fear about "loss of stuff" because something isn't greyed out, your previous packages are all intact. If you purchased during the Kickstarter period, or during the period of Kickstarter packages, you still have all the items that you thought you did. We've got them all covered. However, when it came time to track the stuff in previous tiers, we went from 19 packages down to 12, which required some tricky mapping. For the moment, the content of the old packages are not reflected in the new packages with respect to what you've got included (i.e. what is greyed out). Don't worry. We'll get to that as soon as we can. Just know that we've still got your stuff safe and sound. Thanks this helps. I pledged Artisan +$200 during Kickstarter and I was VERY confused looking at the Store. I'm assuming the $200 Merchandise Credit is the $200 I added above my Kickstarter package? Regarding any fear about 'loss of stuff' because something isn't greyed out, your previous packages are all intact. If you purchased during the Kickstarter period, or during the period of Kickstarter packages, you still have all the items that you thought you did. We've got them all covered. However, when it came time to track the stuff in previous tiers, we went from 19 packages down to 12, which required some tricky mapping. I was anxious to see the new store, but I'm out of money so doesn't really affect me! Hope y'all can get it figured out and get back to your break. Happy Christmas gift to all. Extra KS price continuance! Sorry to hear the team had to take the time out of their breaks. The fact that your team cares to ensure a quality product before release is definitely appreciated. Once that work is done, I hope the team enjoys whatever break they have left! Happy Holidays and Good Health to you! @Vye I just finished paying off my "Count" layaway and wanted to confirm that I am ok regarding the "Old" original package - Count - since I have it paid off before the expiring / changing of the pledges. Just want to make sure I get the old awards and the lower tier pledges awards as well. The package you get is always the same as the one you put your first payment towards, regardless of when you finish paying for it. As long as you put in that first 10%, that tier will always be available to you. I could put Duke on layaway today, and if I finished paying for it 9 months from now, I would have the Duke tier as it exists right now. Posted By **Bamboosniper** at 5:02 PM - Wed Dec 28 2016 > > @Vye > I just finished paying off my "Count" layaway and wanted to confirm that I am ok regarding the "Old" original package - Count - since I have it paid off before the expiring / changing of the pledges. > > Just want to make sure I get the old awards and the lower tier pledges awards as well. > > Kind Regards and Happy Holidays > The package you get is always the same as the one you put your first payment towards, regardless of when you finish paying for it. As long as you put in that first 10%, that tier will always be available to you. I could put Duke on layaway today, and if I finished paying for it 9 months from now, I would have the Duke tier as it exists right now. If it takes another day or two to finish the upgrade - that's ok - Besides, I just heard from a friend that he's going to be pledging to the Astronomer tier (if it still exists when he gets home). Great job on the updates! Do not kill yourselves for our convenience! We can wait, it will help those who haven't made the commitment decide if they want to donate! I have personally put this out in another gaming community's sub form for other games, and there seems to be a steady following! I'll post there of the delay to get it right, Maybe convenience another couple to pledge! Thank you for the update. Take the time you need. Please don't rush. We can wait. thank you for the Update Vye, I think we'd rather wait a bit longer than run into issues. Thank you guys for your time and efforts during your time off. I don't think anyone would complain about waiting on the store for another couple of days so that you have time to decompress and recharge the batteries with your families. However, I sincerely appreciate that you are willing and actively coming in on scheduled time off to continue putting your all into this game and community. Thank you, and Happy Holidays: please enjoy them as much as you can (you only get so many of them). Thank you guys for your time and efforts during your time off. I don't think anyone would complain about waiting on the store for another couple of days so that you have time to decompress and recharge the batteries with your families. However, I sincerely appreciate that you are willing and actively coming in on scheduled time off to continue putting your all into this game and community. Thank you, and Happy Holidays: please enjoy them as much as you can (you only get so many of them). Quick update: The store release will be the 28th instead. The office is closed this week for the holidays, but we found a major issue right before we were to deploy that is blocking us from pushing it out. It, unfortunately, did not show up on our earlier test environments so we've had to recall some team members from their well-deserved time off to resolve it. I can report that they are doing so with gusto, but I wanted to give you all a heads up about it. I'm sending them to bed since it's past midnight so you lucky folks get a few more hours with the old packages. :) Cheers! Guess they are working late, got till 11:59 pm PST for it to still qualify for today. Keep up the good work, take it easy just get a fresh start tomorrow. Deployment is still planned for today. We're doing some additional validation before setting a start time for the deployment. Deployment is still planned for today. We're doing some additional validation before setting a start time for the deployment. Stay tuned. I think there's still a few hours in 'murica until it's the 28th, so they still have time before it's officially delayed. Rumor mill says no, but who knows. Anyone know if they are changing EP prices? I did my part - upgraded and put a Duke/Duchess tier on layaway. I'm actually feeling pretty good about it all - if for some reason I decide not to finish the race to Duke, I'll just convert the payments to credit and design a wicked relic. Bring it on Soulbound! Well, it was almost 5 hours ago that Caspian posted - so assume that it is imminent. I'd hazard a guess it'll be within the next hour, unless we're told otherwise. It's 5:26pm EST. Hey Zultra :) Hope you had a good Christmas! Caspian's reminder message was posted a little over 5 hours ago, so I imagine the update could be happening any time now. Hopefully the transition goes smoothly! Hey Zultra :) Hope you had a good Christmas! Caspian's reminder message was posted a little over 5 hours ago, so I imagine the update could be happening any time now. Hopefully the transition goes smoothly! I had very good xmas. Posted By **Teland** at 10:25 PM - Tue Dec 27 2016 > > Hey Zultra :) Hope you had a good Christmas! > > Caspian's reminder message was posted a little over 5 hours ago, so I imagine the update could be happening any time now. Hopefully the transition goes smoothly! I had very good xmas. is there a time GMT for this? Reminder: The new store goes live later today. You've got about 5 hours left to pledge at the current prices and rewards. **Reminder:** The new store goes live later today. You've got about 5 hours left to pledge at the current prices and rewards. Has there been a delay in the store? Posted By **Caspian** at 10:52 AM - Tue Dec 27 2016 > > **Reminder:** The new store goes live later today. You've got about 5 hours left to pledge at the current prices and rewards. Has there been a delay in the store? Posted By **Caspian** at 08:52 AM - Tue Dec 27 2016 > > **Reminder:** The new store goes live later today. You've got about 5 hours left to pledge at the current prices and rewards. thanks for the reminder! I've been trying to layaway Astronomer before the change but it just hangs after I hit the Confirm button on the overlay. Any suggestions? Make sure you enable pop-ups. 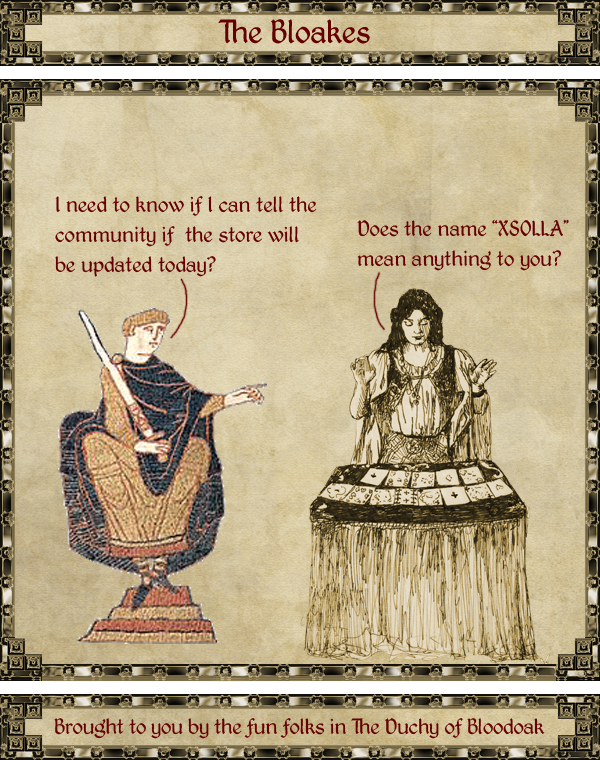 Xsolla occasionally must launch a new tab/window for external verification with your credit card company or paypal. Try a different browser. It worked for me when I had this error. On my mobile phone it didn't work also. Hey, So my bank will be closed on the 26th, so if you guys could push the update back until the 28th so I can upgrade to weapons master that would be awesome. So since I initially layaway'ed the Patron tier, whille I now have to convert it to this new $70 tier as a layaway? The game is in pre-alpha and just started production. There is no release date and I doubt there will be until after alpha. Which is likely several months away at the least, depending on how complete the game is before testing starts. Posted By **RhoAias** at 11:10 PM - Fri Dec 23 2016 > > so could somebody tell me if the game is launched or like in aplha/beta or if there is any release date? I am trying to look everywhere The game is in pre-alpha and just started production. There is no release date and I doubt there will be until after alpha. Which is likely several months away at the least, depending on how complete the game is before testing starts. SBS just started production, not in the pre-pre-alpha stage yet. No release date. Just have design journals of what the game mechanics is to be, a few script video what in-game maybe like. It will be awhile before something tangible becomes available to the community. It could be a great game when full release comes. To @RhoAias: SBS just started production, not in the pre-pre-alpha stage yet. No release date. Just have design journals of what the game mechanics is to be, a few script video what in-game maybe like. It will be awhile before something tangible becomes available to the community. It could be a great game when full release comes. I guess the confusion in the Baron/Baroness tier came by the fact that these new packages you shared are not in full detail? Correct me if I am wrong but these will be the perks that we keep if we supported before Dec 27th correct? Or will we stay with the old plan that we bought at kickstart? Also the Astronomer tier will be replaced with the Magistrate: Does this mean no star or constellation options? Naming a star is not mentioned in the update. Let me know if this is right? We keep all of this correct? Everyone who pledged Baron for their stronghold will be concerned about these changes because due to the lack of details provided, it looks like those who pledge late are losing more with the update. I just want to clarify how it will look after Dec 27th, so everyone can be clear of what they will keep with the tier we bought once it is migrated with Aristocracy Packages. Vye, I guess the confusion in the Baron/Baroness tier came by the fact that these new packages you shared are not in full detail? Correct me if I am wrong but these will be the perks that we keep if we supported before Dec 27th correct? Or will we stay with the old plan that we bought at kickstart? - Baron/Baroness title: Alpha 2 and Exposition, (Merchantile credit replaced with Exposition points), choose Stronghold* and name it (after pledging to a Duke/Duchess), war trison mount, 3 Bonus Sparks of life/ 3 souls (upgrade), cloak identifying rank, acess to expanded crest items - mantle & name and in-game decorative statue (exclusive for kick-starters) - Mayor/Mayoress title: Alpha 2 and Exposition, (Merchantile credit will be replaced with Exposition points), choose Villa or Town* and name it and pledge to a Count/Countess. (Mount* of chosing since this title will not be War aligned), 3 Bonus Sparks of life and 3 souls (update), cloak identifying rank, acess to expanded crest items - mantle & name and in-game decorative statue (exclusive for kickstarters) **Also the Astronomer tier will be replaced with the Magistrate:** Does this mean no star or constellation options? Naming a star is not mentioned in the update. Let me know if this is right? We keep all of this correct? Everyone who pledged Baron for their stronghold will be concerned about these changes because due to the lack of details provided, it looks like those who pledge late are losing more with the update. I just want to clarify how it will look after Dec 27th, so everyone can be clear of what they will keep with the tier we bought once it is migrated with **Aristocracy Packages. ** Thank you! You keep all rewards that your pledge had when the KS launched. Posted By **Serverus1** at 6:01 PM - Fri Dec 23 2016 > > Vye, > > I guess the confusion in the Baron/Baroness tier came by the fact that these new packages you shared are not in full detail? Correct me if I am wrong but these will be the perks that we keep if we supported before Dec 27th correct? Or will we stay with the old plan that we bought at kickstart? > > - Baron/Baroness title: Alpha 2 and Exposition, (Merchantile credit replaced with Exposition points), choose Stronghold* and name it (after pledging to a Duke/Duchess), war trison mount, 3 Bonus Sparks of life/ 3 souls (upgrade), cloak identifying rank, acess to expanded crest items - mantle & name and in-game decorative statue (exclusive for kick-starters) > > - Mayor/Mayoress title: Alpha 2 and Exposition, (Merchantile credit will be replaced with Exposition points), choose Villa or Town* and name it and pledge to a Count/Countess. (Mount* of chosing since this title will not be War aligned), 3 Bonus Sparks of life and 3 souls (update), cloak identifying rank, acess to expanded crest items - mantle & name and in-game decorative statue (exclusive for kickstarters) > > **Also the Astronomer tier will be replaced with the Magistrate:** Does this mean no star or constellation options? Naming a star is not mentioned in the update. > > Let me know if this is right? We keep all of this correct? Everyone who pledged Baron for their stronghold will be concerned about these changes because due to the lack of details provided, it looks like those who pledge late are losing more with the update. I just want to clarify how it will look after Dec 27th, so everyone can be clear of what they will keep with the tier we bought once it is migrated with **Aristocracy Packages. ** > > Thank you! You keep all rewards that your pledge had when the KS launched. Looking for confirmation that Add-on items will not be subject to price change on the 27th. What does it mean by coming with the below? I get the sparks of life but Souls?? A soul is what your characters have and the soul "remembers" skills as it transfers from one character down through it's descendants. As characters age and die, your soul will then inhabit a new character, your heir. For each time your soul inhabits a new character, you will need a spark of life to begin its life (which is the monetary subscription method CoE will use). So with 1 soul and 3 sparks, your soul will last for 3 character lifetimes (maybe 1.5+ years of real time) before you need to buy another spark. For controlling more than one characters at a time, you could use 3 different souls simultaneously (this would be if you want to use alt characters) and they would each take one spark each. Posted By **Armydal** at 10:55 AM - Thu Dec 22 2016 > > What does it mean by coming with the below? I get the sparks of life but Souls?? > > 3 Sparks of Life & 3 Souls A soul is what your characters have and the soul "remembers" skills as it transfers from one character down through it's descendants. As characters age and die, your soul will then inhabit a new character, your heir. For each time your soul inhabits a new character, you will need a spark of life to begin its life (which is the monetary subscription method CoE will use). So with 1 soul and 3 sparks, your soul will last for 3 character lifetimes (maybe 1.5+ years of real time) before you need to buy another spark. For controlling more than one characters at a time, you could use 3 different souls simultaneously (this would be if you want to use alt characters) and they would each take one spark each. Will there be any changes to the Add-on Items (specifically the storebought IP)? Awww... After the 27th the Astronomer tier disappears... where's the love for us Astronomers and Astronomers to be 邏. But seriously, how would it work out EP wise since the their goes away? Does it affect the EP and store credit the current tier has or will it change once the tier changes... I know it sounds like a dumb question, but I'm just trying to to understand it. package wise is an Astronomer considered an Aristocrat? An Astronomer is essentially a Count/Countess that gets to name a constellation, so yes. Unless you want to give away that title, in which case you'd still end up a Baron/Mayor - unless you want to give that away as well - etc. Posted By **Joreel** at 8:59 PM - Wed Dec 21 2016 > > Awww... After the 27th the Astronomer tier disappears... where's the love for us Astronomers and Astronomers to be 邏. But seriously, how would it work out EP wise since the their goes away? Does it affect the EP and store credit the current tier has or will it change once the tier changes... I know it sounds like a dumb question, but I'm just trying to to understand it. package wise is an Astronomer considered an Aristocrat? An Astronomer is essentially a Count/Countess that gets to name a constellation, so yes. Unless you want to give away that title, in which case you'd still end up a Baron/Mayor - unless you want to give that away as well - etc. @Azazel ok, I guess I misunderstood that part. I thought TOTAL INFLUENCE was only to determine who got to pick first during land selection. > >Likewise, someone who backed at the Baron Tier ($250) has 2500 Max Influence, and of that, 625 can be spent on in-game stuff. Posted By **Azazel_Gravespell** at 8:10 PM - Wed Dec 21 2016 > > @ Mysticdream76 the Baron tier is 2500 EP plus the 625 bonus EP so 3150 total EP This is actually incorrect. from: https://chroniclesofelyria.com/blog/9680/We-all-got-em-and-they-all-stink > >Likewise, someone who backed at the Baron Tier ($250) has 2500 Max Influence, and of that, 625 can be spent on in-game stuff. Something that has me a tad worried. The KS tiers never said anything about getting a house at baron/count tiers. But now these new ones at Magistrate tier say you will get a fully furnished villa. So now I'm wondering is this a plus to these new tiers or do the old tiers also come with a house? I second that. So do we get a residence or not? Many people were assuming we did but now I wonder. No, the original packages did not include a Villa or Manor. However, when all the rewards are valued together we wanted to make sure that the new packages were not better than the old ones because that wouldn't make any sense. Those who have an original package and want a Villa or Manor will be able to purchase on with their EP. Unless my math is off somewhere? edit: My apologies, I didn't realize you weren't comparing the baron/mayor tier's. You were comparing the Astronomer/Magistrate tier. I guess losing a county, for a villa wouldn't be too bad. Even then, a house seems like a lot at current prices. Posted By **Vye** at 12:54 PM - Wed Dec 21 2016 > > Posted By **Bokimbol** at 9:34 PM - Tue Dec 20 2016 > > > > > Posted By **Gunnlang** at 12:22 AM - Wed Dec 21 2016 > > > > > > > > Something that has me a tad worried. The KS tiers never said anything about getting a house at baron/count tiers. > > > But now these new ones at Magistrate tier say you will get a fully furnished villa. So now I'm wondering is this a plus to these new tiers or do the old tiers also come with a house? > > > > I second that. So do we get a residence or not? Many people were assuming we did but now I wonder. > > No, the original packages did not include a Villa or Manor. However, when all the rewards are valued together we wanted to make sure that the new packages were not better than the old ones because that wouldn't make any sense. Those who have an original package and want a Villa or Manor will be able to purchase on with their EP. > > It is still a better deal for those with original packages to do this, so nobody should want to switch over to a new package just for something you can buy with EP! :) Under the "Old Baron" tier, we receive 625 EP with the package, . At the current store prices, a "wooden villa" is 1300EP, a "stone villa is "2000 EP. Even if we used the extra $50 merchandise credit on EP, we'd only end up with an extra 600EP for a total of 1225, less than it costs to purchase a wooden villa... Unless my math is off somewhere? edit: My apologies, I didn't realize you weren't comparing the baron/mayor tier's. You were comparing the Astronomer/Magistrate tier. I guess losing a county, for a villa wouldn't be too bad. Even then, a house seems like a lot at current prices. The original $250 package listed "2 bonus sparks" which equals 3 total with the spark from the basic package. I've just gone ahead and listed total sparks instead of 1 + bonus. Posted By **Barqu** at 1:19 PM - Wed Dec 21 2016 > > not read all the comments but has anyone noticed that the current Baron pack at $250 has 2 sparks, the $250 in this list has 3..... > The original $250 package listed "2 bonus sparks" which equals 3 total with the spark from the basic package. I've just gone ahead and listed total sparks instead of 1 + bonus. The original $250 package listed '2 bonus sparks' which equals 3 total with the spark from the basic package. I've just gone ahead and listed total sparks instead of 1 + bonus. What would happen if I purchased the Bloodline tier but start the game as a ward? Wouldn't those two elements kinda cancel each other out? This was talk about before and nope it just means you are not starting with a family to help you out. This is currently my plan. Posted By **Mythheart** at 2:10 PM - Wed Dec 21 2016 > > What would happen if I purchased the Bloodline tier but start the game as a ward? Wouldn't those two elements kinda cancel each other out? This was talk about before and nope it just means you are not starting with a family to help you out. This is currently my plan. Hey Grengar - if you have the Baron tier - you already have the potential of either, depending on the type of community area you choose when you're selecting. When comes the point Baron/Mayor level get to choose - there will be pre-built "seeds" if you will - of towns, villages, strongholds, etc. You will be able to add to your selection with EP expenditure. Strongholds will, as you said, be fortified locations with places like barracks, training grounds, etc. Settlements will be less fortified, but have places like a tavern, individual housing, etc. Choosing either denotes the title you will receive - Mayor or Baron. Edited to add: I don't know for certain if it is possible to completely build your own settlement or stronghold at the start of the game, as in - you place every single building component yourself. I get the sense though from all I've read and heard that they will be giving us pre-constructed options of various types and sizes. This way, NPCs will already be available to you. Hey Grengar - if you have the Baron tier - you already have the potential of either, depending on the type of community area you choose when you're selecting. When comes the point Baron/Mayor level get to choose - there will be pre-built "seeds" if you will - of towns, villages, strongholds, etc. You will be able to add to your selection with EP expenditure. Strongholds will, as you said, be fortified locations with places like barracks, training grounds, etc. Settlements will be less fortified, but have places like a tavern, individual housing, etc. Choosing either denotes the title you will receive - Mayor or Baron. Edited to add: I don't know for certain if it is possible to completely build your own settlement or stronghold at the start of the game, as in - you place every single building component yourself. I get the sense though from all I've read and heard that they will be giving us pre-constructed options of various types and sizes. This way, NPCs will already be available to you. I agree with you Zevryx. I was speaking with Caspian in IRC one day (which means he was just throwing things out there and may not be official), but he stated building a settlement from the ground up would be quite difficult. He did say we would choose from the pre-built settlements, towns, etc. as a Mayor. Becoming a Baron means very specifically signing a contract with the Duke. If I pledged Baron, do I get at day one a fortified stronghold or do I only get a settlement with the possibility to build military structures if I pledge to a Duke? Hello Vye, I have a question regarding to the Baron (old) / Mayor (new) tier: If I pledged Baron, do I get at day one a fortified stronghold or do I only get a settlement with the possibility to build military structures if I pledge to a Duke? Vye, thank hou for the update and your responses to everyones questions/concerns. I have one that might help clear up a lot of peoples concerns with the update. From my understanding of the listed new tiers and their explanations, the new tiers do not include rewards from previous tiers unless explicitly stated, unlike the KS tiers that did. Am I correct in this assumption? So I paid for count but found a place where I want to stay and don't need my title anymore. Will I be able to trade it in before the land selection? If not do I have to use my count title during the land selection so it stays active or will I be able to trade it in after the land selection also? Sorry it that question was answerrd before. Couldn't find anything specific about that. Thank you Vye for giving us advanced notice before the tiers change. baron AND mayor title in one package! Nice! I do not think that is what it is saying. You get an area to rule over, the Barony. However, which title you rule it under depends. You by default have the title of Mayor but if you choose to pledge to a Duke/Duchess you get Baron. This is the same as the old tier. > Posted By **Cronester** at 1:54 PM - Wed Dec 21 2016 > > baron AND mayor title in one package! Nice! I do not think that is what it is saying. You get an area to rule over, the Barony. However, which title you rule it under depends. You by default have the title of Mayor but if you choose to pledge to a Duke/Duchess you get Baron. This is the same as the old tier. Great inclusion of the limits of the layaway system at the end so people are extra informed. It's a great system and I'm using it myself quite a bit but it's not turning water into wine haha. If you haven't finished paying off the layaway, would the backer stuff be effected by these changes on the 28th? Or would they lock and we could still take a bit to get them? cuz from what im reading, even if you backed the founder's tier, but never paid it off, you only get the backer for the founders and not between? If you haven't finished paying off the layaway, would the backer stuff be effected by these changes on the 28th? Or would they lock and we could still take a bit to get them? cuz from what im reading, even if you backed the founder's tier, but never paid it off, you only get the backer for the founders and not between? That confused me at first as well but I'm pretty sure it says you don't get the stuff in between until you've paid off the full amount. As long as you "lock it in" you are paying towards having that particular title and everything that comes before when your payments are complete. Posted By **Hezrou** at 12:32 AM - Wed Dec 21 2016 > > If you haven't finished paying off the layaway, would the backer stuff be effected by these changes on the 28th? Or would they lock and we could still take a bit to get them? > > cuz from what im reading, even if you backed the founder's tier, but never paid it off, you only get the backer for the founders and not between? That confused me at first as well but I'm pretty sure it says you don't get the stuff in between until you've paid off the full amount. As long as you "lock it in" you are paying towards having that particular title and everything that comes before when your payments are complete. You will ultimately receive all the rewards up to the level you pay off with layaway (all that "and all previous rewards" stuff) but you don't unlock interim rewards along the way, such as access to the Early Access Forum, access to Exposition, etc. Posted By **cjmarsh** at 12:50 AM - Wed Dec 21 2016 > > Posted By **Hezrou** at 12:32 AM - Wed Dec 21 2016 > > > > > If you haven't finished paying off the layaway, would the backer stuff be effected by these changes on the 28th? Or would they lock and we could still take a bit to get them? > > > > cuz from what im reading, even if you backed the founder's tier, but never paid it off, you only get the backer for the founders and not between? > > That confused me at first as well but I'm pretty sure it says you don't get the stuff in between until you've paid off the full amount. As long as you "lock it in" you are paying towards having that particular title and everything that comes before when your payments are complete. You will ultimately receive all the rewards up to the level you pay off with layaway (all that "and all previous rewards" stuff) _but_ you don't unlock interim rewards along the way, such as access to the Early Access Forum, access to Exposition, etc. Maybe I'm missing something, but what's the difference between the current barron tier and the upcoming mayor tier? My guess is that the missing value may be in the rewards the mayor would have gotten from the lower tiers. Also, it's possible these mayors won't be able to get the mantle for their coat of arms. Posted By **kuthedk** at 07:13 AM - Wed Dec 21 2016 > > Maybe I'm missing something, but what's the difference between the current barron tier and the upcoming mayor tier? My guess is that the missing value may be in the rewards the mayor would have gotten from the lower tiers. Also, it's possible these mayors won't be able to get the mantle for their coat of arms. Baron and Mayor are the same thing, but a Baron is a title granted by a Count. So if you are running a town as a Mayor and you serve a Count, you become a Baron in title. They are the exact same thing though. Also, instead of store credit (which would be 50$ in the current Mayor tier) you get bonus EP (presumably 50$ worth). That's the only change specifically highlighted by this post, any other changes we have to wait and see. You get a Baron title if you pledge your alligance to a duke not a count where as if you are a Mayor you are under the jurisdiction of the count your settlement resides in. Barons will also be had of military settlements where as Mayors lead civilian ones. Posted By **hboy22** at 4:17 PM - Wed Dec 21 2016 > > Baron and Mayor are the same thing, but a Baron is a title granted by a Count. So if you are running a town as a Mayor and you serve a Count, you become a Baron in title. They are the exact same thing though. Also, instead of store credit (which would be 50$ in the current Mayor tier) you get bonus EP (presumably 50$ worth). That's the only change specifically highlighted by this post, any other changes we have to wait and see. You get a Baron title if you pledge your alligance to a duke not a count where as if you are a Mayor you are under the jurisdiction of the count your settlement resides in. Barons will also be had of military settlements where as Mayors lead civilian ones. Well, the current mayor/baron tier is @ 250 USD, where as the Magistrate tier is 500. It's basically using the extra $250 towards a huge house, where at current mayor, you aren't gaurnteed a huge villa or manor, just something that is in your town. Hope that helps! Posted By **Gunnlang** at 12:22 AM - Wed Dec 21 2016 > > Something that has me a tad worried. The KS tiers never said anything about getting a house at baron/count tiers. > But now these new ones at Magistrate tier say you will get a fully furnished villa. So now I'm wondering is this a plus to these new tiers or do the old tiers also come with a house? I second that. So do we get a residence or not? Many people were assuming we did but now I wonder. Hmm, I was under the impression that when you entered the world for the first time that you took the place of an NPC, usually with a family. So, the NPCs are living in caves? Or in places without shelter? In the middle of winter? Poor NPCs! As Countess, I will build homes for the poor homeless NPCs, feed the hungry, clothe those without clothing, give jobs to the jobless! All sparks listed here include the base spark with the game purchase. They have the exact same amount of sparks as the current tiers do. Current tiers only list "Bonus Sparks" additional to the initial Elyrian Tier. No worries. It was my understanding from the Whats In Store For You release that there will be expanded store options allowing you to move around your existing pledge. To what degree, how it is accomplished, and what you'll gain/lose by doing so - still remains as yet unclear. It was my understanding from the [Whats In Store For You](https://chroniclesofelyria.com/blog/12300/Whats-in-store-for-you) release that there will be expanded store options allowing you to move around your existing pledge. To what degree, how it is accomplished, and what you'll gain/lose by doing so - still remains as yet unclear. Presumably, there will be a way for those with existing tiers to change over to the new tiers if they choose to. I'm not stating that as fact, but I'd be surprised if there were no option to "cash out" on your current tier and reallocate as you see fit. so if i bought Astronomer i could potentially reallocate to magistrate or governor? Also how do i upgrade to a Magistrate or a Governor if i am already a Baron but want the extra benefits? so therefore if you got the Baron title (now or earlier) would you get 2 or 3 sparks of life? Looking forward to seeing the new site design. Hope to see more purchase their Kick Starter packages while they can!